Manchester United's last trophy arrived with a routine Europa League final triumph over Ajax in Stockholm two years ago. Events in Barcelona and Turin on Tuesday showed how times have changed. Ole Gunnar Solskjaer's fifth defeat in eight matches saw United outclassed by Barcelona in the Nou Camp, while Ajax evoked the grandest traditions of the Amsterdam academy to beat Juventus on their own turf and deservedly reach the Champions League's last four. It was a stark reminder that United are now light years behind Europe's elite - even teams they would have regarded as inferiors not so long ago. Better United teams than this average band have fallen victim to Lionel Messi and company down the years, but it still served as grim evidence of the club's poor transfer business and flawed strategy in recent years. And for all the euphoria that accompanied Solskjaer's arrival as interim - and later permanent - manager following Jose Mourinho's exit, now is the time for him to show what he is made of. Solskjaer has much to do and much to prove. The smiles he exchanged with former United boss Sir Alex Ferguson before kick-off - at the ground where his goal won the 1999 Champions League final - were wiped off by half-time. Now, with the Champions League gone - Barcelona having been spared the unlikely comeback that stunned Paris St-Germain in the last round - Solskjaer must confront the battle to get United back into the tournament next season. Paris was a sporting miracle, but sporting miracles do not happen often and this cold correction of football logic showed that United - this United - do not belong in such exalted company. This is a situation years in the making but now it is Solskjaer's to resolve. Ole, as the song always says, is at the wheel - and it may be a rocky road ahead. The baby-faced assassin must now prove that a streak of steely ruthlessness lies behind the smiling exterior because this team is not fit to challenge for the big prizes. United's line-up in Barcelona offered a vivid outline of just how momentum has been lost, how failure to rebuild and unstructured work in the markets have left them as also-rans. 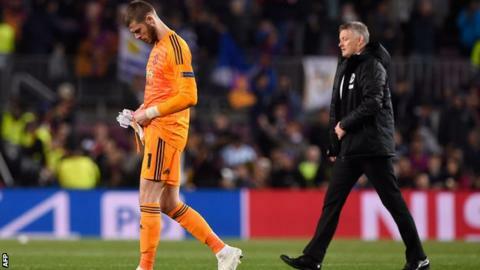 Four of United's back five at the Nou Camp - David de Gea, Ashley Young, Phil Jones and Chris Smalling - were in the starting line-up when United lost in Basel in December 2011 - a result that meant they failed to reach the last 16 of the Champions League for the first time in six seasons. Now Solskjaer and United's executive vice-chairman Ed Woodward - who must finally show he has a handle on footballing matters - face a period of serious reconstruction. This will be a crucial summer for Woodward in particular. There will be investment but there can be no more mistakes or missteps on the scale he has presided over so far. Solskjaer is still a gambler's appointment and Woodward must hope the dice rolls well for him and his manager. It is painful for all at Old Trafford to contemplate, but how many of United's current team would get anywhere near those assembled by Pep Guardiola at Manchester City or Jurgen Klopp at Liverpool? Many of those who lurk on the margins of those two squads would be instant contenders at United. Young, at 33, has served United well but this has every appearance of a season too far. He gave a tortuous performance in Barcelona's first-leg win and was a major weakness again in the Nou Camp, his lack of control leading to Messi's admittedly brilliant first goal. It is a brutal truth but his time has come. He will surely be thanked for his services and moved on at the end of the season, while Smalling and Jones are hardly figures of reassurance against the sort of teams United wish to compete against. After a good start, in which Marcus Rashford flourished, all United's failings were unpicked, aided by the self-inflicted wounds of Young's error for Messi's opener and De Gea's inexplicable blunder for his second. And the worry for Solskjaer is that even those he would regard as his big players, De Gea and Paul Pogba, have question marks against their names. De Gea is an outstanding goalkeeper and even the very best can make mistakes like his on Tuesday, but his season has been touched by inconsistency while Pogba remains enigmatic. The France World Cup winner is suddenly linked with Real Madrid after a few decent games but there have been plenty of others where United fans would have every right to ask what all the fuss is about. He has quality but not consistency. He was bought to shape games such as this but instead was almost a bystander. Solskjaer has things to work with in attack thanks to the pace and invention of Rashford and Anthony Martial and the talent of Jesse Lingard, but what about £90m Romelu Lukaku? He has got goals this season but was not selected in Barcelona. Will he be part of United's long-term plans should a tempting offer arrive? United need a quality right-back and a central defender of actual authority. In the case of the latter, United must pay what it takes to plug a gaping hole and provide leadership. Napoli's Kalidou Koulibaly and Tottenham's Toby Alderweireld, with a £25m release clause, must be under consideration. Fred has improved in recent weeks but has never looked worth the £52m he cost. United also need more class in that area, although Scott McTominay has shown maturity and quality. He is learning on the job but shows rich promise. Rashford and McTominay will be key parts of the future but uncertainties surround them elsewhere. Solskjaer knew the task in front of him and it is one that would be daunting for a manager of huge experience, let alone one whose track record is failure at Cardiff City and work in his homeland at Molde before being asked to transform a footballing institution. He deserves time as he inherited this situation, he was not its creator - but there are defining weeks ahead if United are to even get within touching distance of Liverpool and Manchester City, let alone Europe's superpowers such as Barcelona. Ole might be at the wheel - but the punishment in Barcelona shows he is driving a vehicle that has been allowed to fall badly into disrepair and is now in need of expensive parts and a major service. Manchester United are way off Manchester City and Liverpool but it's about how they bridge the gap now. Do they go down the route of recruiting the best young talent and try to mould them in the United way rather than buying ready-made players who maybe don't have their heart in it? Scott McTominay did not stop all night and if you can put that work-rate and attitude into players who have more ability, that would be great. Roy Keane and Paul Scholes had it but they were world-class players as well. There was a gulf in quality between the two sides. PSG were the better side over two legs in the last round but United rode their luck. Barcelona were on top and two wonder goals from Lionel Messi and Philippe Coutinho were the difference. Ole Gunnar Solskjaer has a lot of work ahead of him but he will have seen little things from his players about who kept battling and who kept playing. Solskjaer now has an unenviable task of trying to rebuild this squad. It is going to be a transitional period for the club because they have to win titles - but they are miles off. It would have been great to see Manchester United go through but this club needs a big clearout and it's a massive summer coming. They are miles off winning the Premier League and even further off winning the Champions League.